When you think of teenage problems, what typically comes to mind? Passing a big exam, who to ask to prom, college applications, getting a driver's license --- ya know, things of the mundane sort. But Lena Duchannes isn't your average teenager and driving is the least of her problems. What the good people of Gatlin don't know is that Lena's a castor, a witch who will be claimed for either the light or the dark upon her sixteenth birthay. This claiming has the power to irrevocably change her life and the lives of all humans, because unbeknownst to her, she will be the strongest castor of all. Ethan had no idea what was in store for him when he befriended the mysterious outcast, Lena. Now he's caught up in a mystical battle between good and evil as he struggles to protect the girl he loves. Fates will forever be changed, secrets uncovered and choices made as a dark power takes hold on Lena and the town. I think most of us are aware that Beautiful Creatures was a book first and movie second. I haven't yet read the novelisation but with the recent YA book to movie boom, it's no surprise why they chose to adapt it for the silver screen. There's romance, magic, intrigue and a bevy of young, beautiful people and a setting that's to-die-for. 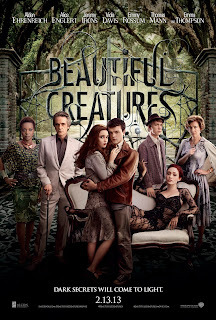 Beautiful Creatures is a coming of age story, only what sets it apart is the tinge of paranormal romance. Think Twilight only with stronger characters and so much more substance. What more could you want? Well, some coherency for one thing. I'm not saying I didn't enjoy the movie, but I've gotta admit, at times it was a little hard to follow. My biggest problem with Beautiful Creatures is that it's difficult to discern how much time has passed between scenes and timing is sort of, um, critical considering Lena's predicament. Also, it felt like huge chunks of ctitical information were missing in places though I am aware this could be because I haven't read the book. I'm just glad I went with my BFF who read the series to fill in the gaps where I was floundering. And even then, she too, had some issues with following along. So in regards to reading the book and watching the movie, I'd say you're damned if you do, you're damned if you don't. Other than that though, the movie has a ton of potential and I was able to overlook many of it's smaller flaws. The strength of this movie lay in its amazing cast. Alden Ehrenreich (as Ethan) exudes this warm goofiness that endeared him to my heart. He's believable as the small-town guy with big dreams and the chemistry he shared with Englert was palpable. Alice Englert (as Lena) played the tempramental teen to perfection which is fitting for both the character's age and her precarious situation. She is, simply put, stunning. I also thought Jeremy Iron's (as Macon Ravenwood) performance was as equally powerful as his eccentric character. The only surprising performance that fell a bit flat for me was Emma Thompson's. As incredibly talented as she is, I thought she was a bit too over-the-top for my liking and it felt too theatrical for the grim nature of her character. All in all, the cast shined and played off eachother so well. If the actors don't appease you in Beautiful Creatures, the setting sure will. LaGravenese painted a perfect picture of the lazy Southern small town. Ethan described it best, "My momma says there's two types of people that live in Gatlin, the people too stupid to leave and the ones too stuck to move," and I thought it was spot-on. The cinematography is haunting and ominous and magical and it plays well to the overall tone of the movie. I think it's interesting how LaGravenese tried hard not to rely too much on CGI SFX, instead, forgoing the green screen in favour of more traditional methods --- it is well noted and much appreciated! Overall, I did enjoy the movie despite being hard to follow and I'm eager to read the book series. It's a good one, just not perfect. 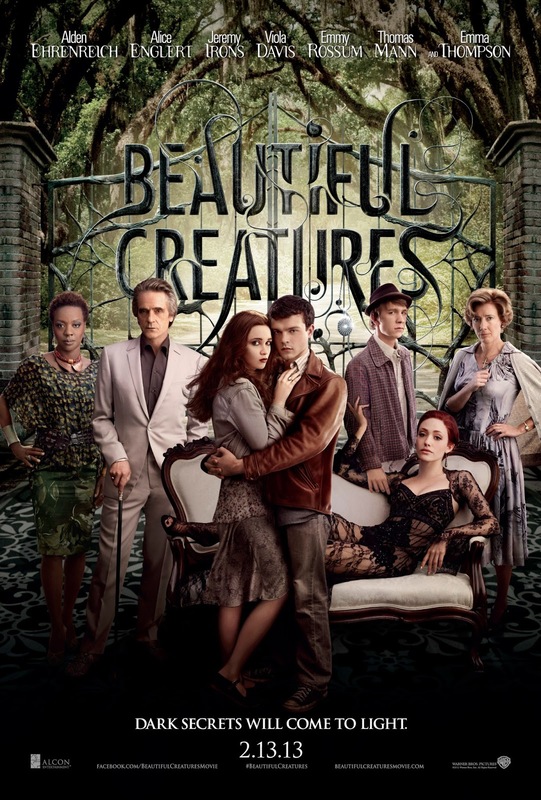 If you're looking for another Twilight, Beautiful Creatures is it --- only it's so much better. While not exactly the greatest movie-going experience, I liked it enough to hope for a sequel. Ehrenreich is charismatic and Englert stuns as the leading duo. And if the characters don't sweep you away, the charming setting will. With a bit more clarity this one would have most certainly been a winner! The cast are the main reason I want to see this movie! I haven't read the book but I'm not particularly drawn to it. The movie is nothing, if not, charming, for sure. I just feel like it could've been a bit more cohesive. I'd say, if it wasn't for the amazingness of the cast it would've probably been a dud. I think there's an assumption with these book to movie adaptations that a lot of the viewers would have read the book, which is a little risky - I have the book but the chances of me reading it in the next 3-6 months are almost nil - I've heard too many negative comments to be all that interested in bumping it up.